16 E. Piper Lane Prospect Heights, IL 847-749-0633 info@heimatecinc.com www.heimatecinc.com Stuck on a tough tooling challenge? Let us help. Heimatec isn't just a world leader in live tools, angle heads and multi-spindle drill heads; we're your source for problem solving and tooling application expertise. With years of hands-on experience and the most innovative tooling, we are your TOTAL solution source. Put us to the test and send us your toughest tooling challenge. Modern Machine Shop 209 IMTS 2018 Cutting Tools and Tooling Tooling Line Enables Trepanning on a Mill Manufactured by Kaiser Tool Co., Thinbit's Mill A Groove toolholders and inserts are designed to trepan on a CNC mill. According to the company, capability for quality finish makes the tools ideal for sealing surfaces. 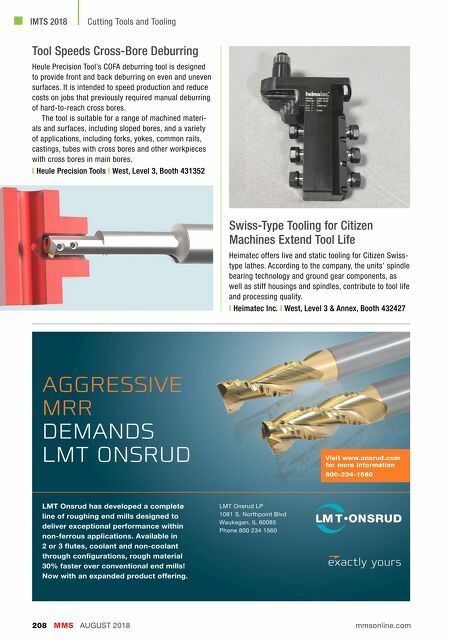 Other advantages include the elimination of secondary lathe operations for face grooving; a large cross-section that provides strength, and the availability of custom inserts to match the groove form. In addition, groove diameters are concentric to spindle rotation, not table movement. The inserts do not rotate about their own centers, so the groove can be symmet- rical or asymmetrical. Step grooves, convex and concave radius grooves, chamfered edges, angles and special profiles can be made with a single insert. When machining in 6061 aluminum, a tool can cut a groove 0.125" wide × 0.200" deep × 4.98" in diameter in 18 seconds. The toolholders are designed to work in combi- nation with boring heads and are available in common sizes with straight and 90-degree orientations. Inserts are available from 0.004" through 0.150" in 0.001" increments. Major diameters start at 0.300". Inserts are available in sub-micron grain carbide grades for ferrous and non-ferrous materials and HSS for composites and plastics. Inserts can be coated with TiN, TiCN, TiAIN or diamond film. PCD and CBN tipping options are available for hard or abrasive materials. 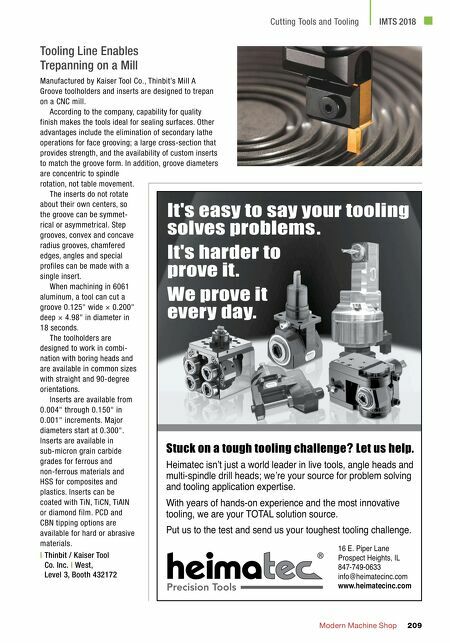 | Thinbit / Kaiser Tool Co. Inc. | West, Level 3, Booth 432172 It's easy to say your tooling solves problems . It's harder to prove it. We prove it every day. 16 E. Piper Lane Prospect Heights, IL 847-749-0633 info@heimatecinc.com www.heimatecinc.com Stuck on a tough tooling challenge? Let us help. Heimatec isn't just a world leader in live tools, angle heads and multi-spindle drill heads; we're your source for problem solving and tooling application expertise. With years of hands-on experience and the most innovative tooling, we are your TOTAL solution source. Put us to the test and send us your toughest tooling challenge.